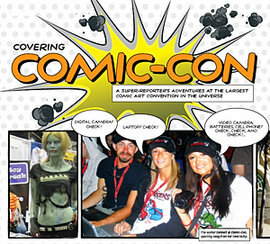 Covering Comic-Con: A Super-Reporter's Adventures at the Largest Comic Art Convention in the Universe! 1/4/2010Share this story on Facebook! Between my courses at the Park School and writing for the Ithacan, ICTV, and the Ithaca Times during my first three years at Ithaca College, I thought I’d experienced every medium and learned all about multimedia technology, but reporting at Comic-Con was a real eye-opener to the way journalism is changing. There were no reporters with notebooks or handheld recorders. Instead, it was photos, videos, and articles being edited and uploaded right there as the news was happening, reaching the web instantaneously. It seems that most journalism today is all about timeliness and choosing the best medium to tell your story, even if it means you have to shove a few paparazzi. Like a kid at Disneyland for the first time, I wandered awestruck through aisle after aisle of comic books, video games, memorabilia, and colossal advertising exhibits from every major Hollywood studio. As the convention center filled up, it began to look more and more like Halloween in July. Watch this video from Comic-Con! Weaving through the crowds, I spotted fans of all ages dressed as the Mad Hatter, Poison Ivy, Harry Potter, and Spock. Some even brought props, like lightsabers. The creativity of the costumes was astounding, as was the abundance of spandex. But there was no time to stop and gawk at the authentic Alien and Predator duo walking in my direction. I was on a mission: to make my way to legendary Hall H, the main conference room for the convention. Super-powerful press pass in hand, I bypassed the line (rumored to be up to six hours long) and took a seat next to a writer from IMDb. This plum internship came courtesy of the Ithaca College James B. Pendleton Center in Los Angeles, an extension of the Roy H. Park School of Communications that’s open to juniors or seniors with a major or minor in communications. At Comic-Con, I wrote about press conferences and presentations from the cast and crew of upcoming major motion pictures such as The Twilight Saga’s New Moon, Sherlock Holmes, and Avatar. I covered panel discussions about soon-to-be-blockbusterhits like Ironman 2, starring Robert Downey Jr., Scarlett Johansson, and Gwyneth Paltrow. The film’s director, Jon Favreau, also addressed the audience about what they can expect from the superhero sequel. The appearance of Robert Pattinson andKristen Stewart to promote The Twilight Saga’s New Moon elicited shrieks and tears of excitement from numerous fans in the audience. I listened intently to Hollywood directing legend James Cameron (Titanic and the Terminator series) and powerhouse producer Peter Jackson (The Lord of the Rings, King Kong) as they explained the moviemaking magic behind their much-anticipated sci-fi projects Avatar and District 9, respectively. Most journalists were there to generate online content for various news organizations, myself included. We all raced to be the first to put up the best articles, videos, and photos. Reporters representing hundreds of entertainment websites pushed and shoved for power outlets in order to get their articles up. Getting this done as fast as possible was important, as each event was quickly followed by the next. As a journalism major, I’m used to writing articles and reviews under a tight deadline. But what’s online media without visuals? I’m no photographer, but I grabbed my camera and sank into the sea of paparazzi swarming around the Hollywood A-listers. There was no time for being starstruck, though. Security held back the screaming fans as I struggled to get the perfect photo to accompany my articles. I glanced to the professional photographers beside me for tips. The lights from the thousands of cameras flashing around me blurred my vision as I raised my hand and gathered the courage to yell Transformers star Megan Fox’s name. “Megan!” I screamed. “Mind posing?” I asked the actress politely, waving my camera above my head. With her hand on her hip, she faced my camera and gave me a wink. The photographers beside me thanked me for the great photo op. Some of the event’s greatest moments called for video rather than writing. When Johnny Depp greeted his director and friend Tim Burton onstage, thousands of people rushed toward the actor to record him on their camera phones. Four days, 20 posts, four articles, and hundreds of photographs later, my mission was complete. For the sequel, next summer someone from IC will get to cover Comic-Con 2010: me! I landed a full-time job with Famous Monsters of Filmland and will head to California after graduation. Stay tuned for the further adventures of super-reporter Danielle Paccione!